Wet wood rots quicker….Another Fact! Stop Rot Now! Keep…Wood…Dry !! The interior of the bus, all the cupboards, cabinets, bed frame and so on, were going to be made out of wood and the bus, at times, can be damp. Especially during winter time. So, if you’re making wooden stuff to go in the bus and you don’t want rot then you need wood that stays dry. Or as an alternative to dry wood, you could simply use live wood, that’s to say, wood that’s still alive. If you can keep your wood alive it should stop it from rotting. But then if you keep it alive you’d have to carve your cabinets from one tree and keep the roots in plenty of soil. And remember to water it or it will die. Imagine that, a tree bus that will never rot…unless you forget to water it, of course. On the downside, if the wood is still alive, it would carry on growing, and before you know it the bus would be too full of live tree making it really difficult for you to actually get inside, unless you hollowed it out. And during autumn there would be a lot of leaf drop to sweep up, not to mention bird nesting, squirrels and fruitbats. Conclusion. Don’t carve the wooden interior of the bus out of a living tree and then try to keep said tree alive. You will eventually run out of room and more than likely your bus will get nicked by a bunch of thieving squirrels. It’s a daft idea, unless you’re a fruitbat. So, with the live wood idea abandoned we needed to find the best dead wood that stays dry. Sarah the Researcher researched the best type of wood to use that wouldn’t rot, lose its shape, warp or split. Sarah didn’t fail in this task. The wood that Sarah found was so damn good it can also be used to make completely waterproof wooden submarines. But at £3squllion a square foot we decided that perhaps the wood we needed didn’t have to be quite so underwaterproof. The next best thing we found was a fancy sort of plywood held together with a strong waterproof glue. Still expensive stuff, but then we were only going to do this job once, so it made sense to use a high specification material. Our local Jewsons had some in stock. Our local Jewsons also had an ex-VW owner working there. We learnt a lot about his bus. A lot. We were wooded up and ready to start building, whatever the weather, come rain or shine, drizzle, flood or tsunami. It would be comforting to know that if the bus were to ever be swept away on the tide or if it fell into a harbour or it got mixed up with the dirty laundry that at least the cupboards would be ok. Presumably a wooden submarine would have a good chance of floating rather than submerging? Wouldn’t it? Don’t build your submarine out of wood. Another daft idea. If you’re going to build a submarine build it out of lead, the world’s heaviest thing. Apart from my Dad that is, who spends his entire life wondering why the tide’s always coming in whenever he goes for a stroll down the beach. Which, I have to say, is not a bad thing really. Because, if ‘Save the Whale’ saw my dad lolling along the sea front they’d be trying to drag him back into the sea. So pulling the tide in does have its benefits. 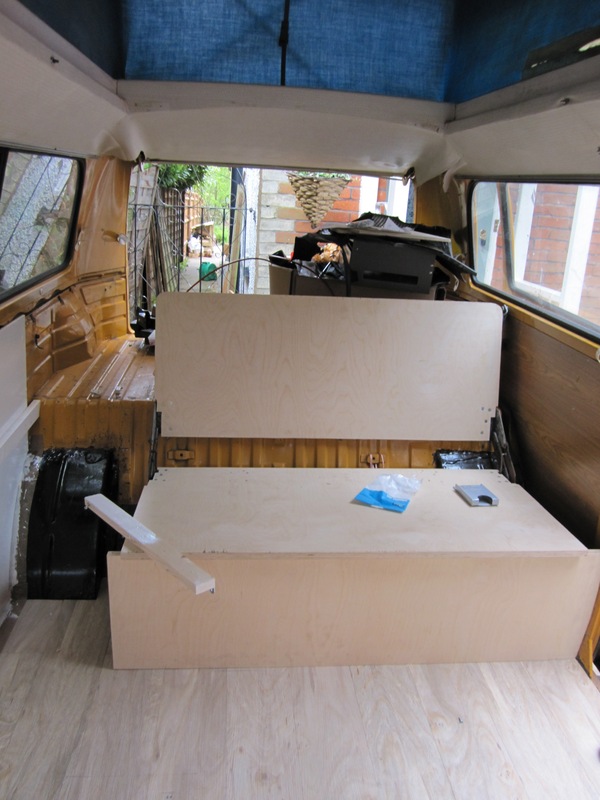 This entry was posted in The SapaBus Blog and tagged campervan refit, Type 2 interior, Type 2 Refit, VW Bay, VW Campervan. ← BLOG 20 – AHHHHHhhhhh !